Folks from abuse.ch spotted an interesting piece of ransomware malware currently circulating in the wild. Current release is infecting Windows users. It seems that Cybercrooks are taking advantage of Anonymous Banner, for conducting such malware campaigns and supposed to be another game by opposite parties for discredit/Infamous the name of Anonymous in the eyes of the world. Before twitter user @FawkesSecurity posted a threat to bomb a government building by Anonymous. But later, collective group clear themself by statement, "Anonymous is not a terrorist organization. Anonymous does not use bombs. Anonymous does not condone violence in any way. Anonymous supports justice and universal equal rights. We support peaceful protest." Ransomware malware restricts access to the computer system that it infects and demands a ransom paid to the creator of the malware in order for the restriction to be removed. 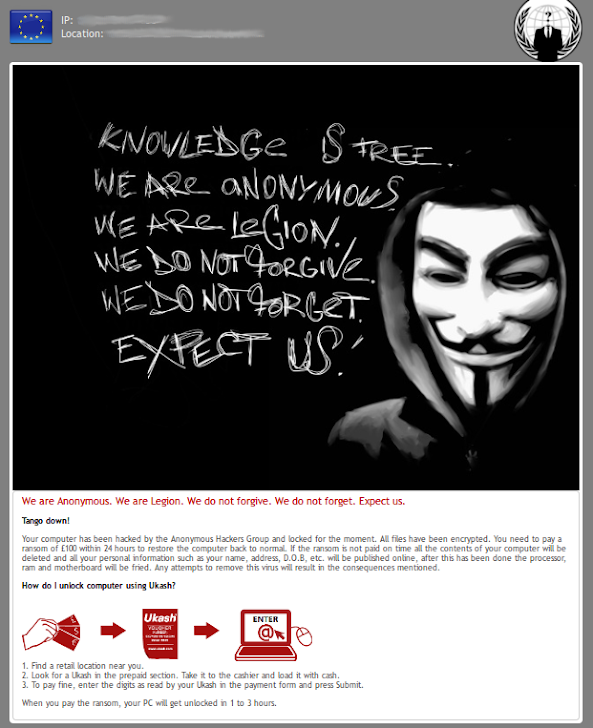 Message read "Your computer has been hacked by the Anonymous Hackers Group and locked for the moment.". Ransomware asking for €100 in order to restore victims computer to normal stage, otherwise malware warn that if user will not pay money in 24 hours, all files from computer will be deleted and their personal infomation can be posted online, and moreover malware claim to overclock system for converting it into a bomb (seems to be just fake warnings and inspired from movies). Malware size reported around 47.0 KB ( 48128 bytes ) and 23 out of 44 Antivirus engines are currently able to detect this new malware as shown by VirusTotal report.